Imagine for a moment that you inherit a beautiful custom-made motorcycle from a relative. You are thinking how great it is that you have inherited this vehicle and love to show it to family, friends, and neighbors. You are also thinking to yourself how cool it is that you don’t have to spend your own money on this mid-life crisis speed machine. And then one day you go to your mailbox and open up a certified letter from an attorney. 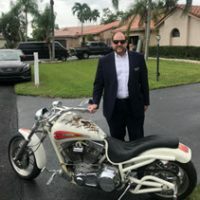 The certified letter states that you have refused to return the custom-made motorcycle, cites a Florida statute, and at the end of the letter it states that you have thirty days to pay for triple the value of the subject vehicle and attorney’s fees, and if you fail to do so then you a lawsuit will be brought against you. Well, under this scenario you have just been served with a civil theft demand pursuant to § 772.11, Fla. Stat. Florida’s civil theft statute is an incredibly effective tool in retaining possession of items or increasing claims. Here is how it works, prior to filing a lawsuit for civil theft, a party must serve a pre-suit demand letter to the person liable for the damages. See § 772.11, Fla. Stat. The demand letter must demand $200 or the treble damage amount of the claim. If the recipient of the demand letter complies and pays the money within 30-days of receipt of the letter, the person is relieved of any further civil liability and shall be given a written release of the claim. Under our scenario, assume the custom-made motorcycle was worth $50,000.00, that means the civil theft demand will request triple this amount, $150,000.00 to be paid in order to avoid further litigation on the claim. The penalties for civil theft are enormous, triple the amount of damages incurred. A such, there are heightened requirements that must be proved in order for a Plaintiff to prevail on its civil theft claim. Rather than the traditional clear and convincing evidence burden that civil Plaintiffs are customarily charged with, in a civil theft claim a Plaintiff must prove it claim by the heightened clear and convincing evidence standard. As the appellate court stated in Slomowitz v. Walker, 429 So. 2d 797 (Fla. 4th DCA 1983), “clear and convincing evidence requires that the evidence must be found to be credible; the facts to which the witnesses testify must be distinctly remembered; the testimony must be precise and explicit and the witnesses must be lacking in confusion as to the facts in issue. The evidence must be of such weight that it produces in the mind of the trier of fact a firm belief or conviction, without hesitancy, as to the truth of the allegations sought to be established.” Furthermore, civil theft claims require proof of “felonious intent.” Simply put, this means a plaintiff must prove that one “knowingly obtained or used or endeavored to obtain or use” plaintiff’s property with felonious intent to either temporarily or permanently deprive plaintiff of its use of the property. Recently Sweeney Law, P.A. was retained to represent an individual to retain possession of a custom-made motorcycle, that was priceless due to the extensive family history and sentimental value. Payment of monies for the motorcycle was never the goal, getting the motorcycle back was the primary objective. We prosecuted the claims very aggressively and were happy to get the custom-made motorcycle back to its rightful owner. Despite the contentious litigation, our result was obtained rather quickly. Which in turn, led to yours truly spending a Sunday morning out of town, retaking possession of the custom-made motorcycle, and getting my picture taken along the way. Brendan A. Sweeney, Esq., of Sweeney Law, P.A., has prosecuted and defended millions of dollars of civil theft claims throughout Florida. Brendan A. Sweeney, Esq., is an AV Preeminent Martindale Rated Attorney, that has been recognized as a Florida Super Lawyer in 2019 and as a Florida Super Lawyer Rising Star in 2018, 2017, 2016, and 2014. If you have any Florida civil litigation questions and/or issues then contact Sweeney Law, P.A. at (954) 440-3993 immediately to protect your rights. www.sweeneylawpa.com.